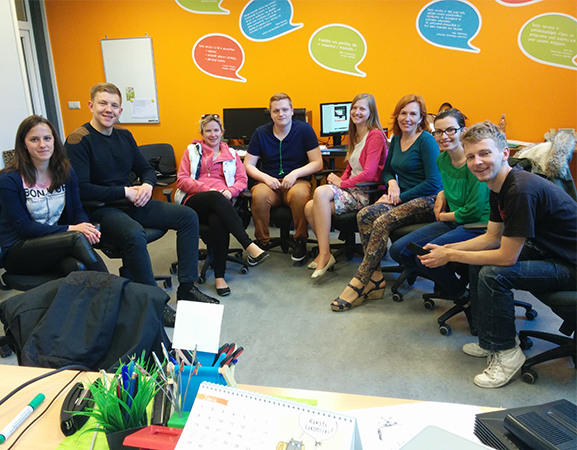 In the regional city of Liepaja the Latvian Information and Communications Technology Association (LIKTA – abbreviation in Latvian) in cooperation with the Ltd. Lattelecom Call Center conducted a selection of youth, training and internship within the framework of the project fit4jobs. In Liepaja the selection and training of the youth, and also the internship was successful, as one of the main reasons could be mentioned that the Liepaja’s group was already involved with the employer from the beginning of the training, and during all of the training process theory was mixed with practical work. The employer was looking for employees who could work in the customer service, supporting customers regarding IT questions. Liepaja is a quite large city in the region, but it isn’t easy to find employees in any of the regions, because the employer needs employees who have some understanding of IT technology and different equipment, and so on. Those are usually young people aged 18-25 years. The main challenges are knowledge of technology and also knowledge of the Russian language. Unfortunately, not all of the young people have good knowledge of the Russian language, which is necessary for working with clients in Latvia. Usually potential employees are young people who have recently graduated from schools, universities, and have no experience to work with customers. The testing process, that was applied in the selection before interviews with potential candidates, was highly rated by the employer. Therefore candidates could be selected according to the test results. After the evaluation of the results the decision was made - whether these candidates will be able to perform the work which is mainly connected with customer technical problems or not. project to get a confirmation that the tests are successful tool in the recruitment process. It was concluded that potential employees could be those who get not less than 50 % of correct answers in the tests. You might ask - why 50%? By evaluating the test results and comparing them between different training groups it has been observed that trainees, who have reached more than 50% in the tests, have been successfully trained for acquiring the necessary skills and getting to understand the training materials. At the beginning of testing phase the candidates whose performance was less than 50% were also invited to participate in the training, but it was concluded that for these candidates it was more difficult to perceive the training material and the training process was more difficult for them as a whole. As a result the decision was made together with the candidates to terminate the training by highlighting the weaknesses which need to be improved upon. Fit4jobs tests are an excellent start, because different blocks are included in there, which are important for one to work with clients. Overall the tests could help to devise a training program taking into account weaknesses and strong sides of the candidate. “In particular, we require that the person possesses logical thinking, customer service knowledge, numerical thinking, visual perception, basic IT skills - all of these blocks are also included in the test. By evaluating these test results it is possible to understand what the candidate’s weak point is and make the decision whether this is an appropriate candidate for the specific work requirements or not”: says the training expert Alona Rastihina, Ltd. Lattelecom Call Center. Mostly the weakest results are in Customer Service, it is understandable, because many of the candidates don't have any experience in this field, so during the training we should focus mostly on these questions. Also the candidates have benefits from testing, because when they analyze the results they can see their strong sides, as well they can understand which position is more suitable for them. For example: the candidate's results show that he has a good visual perception, but the numerical, logical and computer science skills are estimated to be lower than the acceptable level they should be at, it means that he couldn’t work in a position that requires concentration for a long period of time as would be necessary for the employer. Young people who participated in the project have been successfully integrated in the work environment, because after the training process they had to work with the current staff. Mentoring techniques are used quite often as well, as they also contribute to the integration. 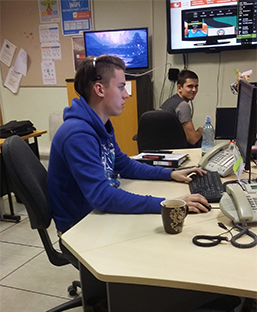 When evaluating the results of the project and the young people who currently work in the Ltd. Lattelecom Call Center in Liepaja, it can be concluded that testing should be the main part of the training and one of the requirements as well, because it helps to select people with good or even excellent skills according to the employers requirements. Alona thinks that perhaps the training process was improved and was more successful due to the fact that all of the trainees were on the same level, which was also convenient for the process of developing the training material. FIT4Jobs is a European-funded piloting programme based on the successful FIT model of upskilling job seekers and connecting them to employers. The project has originated from an official pledge made by FIT to the Grand Coalition for Digital Jobs. The objective of the project is to recreate the FIT model in Greece, Spain, Portugal, Latvia and Lithuania, together with partner organisations from six EU countries. The long-term vision is that this model, if tested, could prove to be viable in participating countries achieving over 100,000 job placements per year in Europe.